A Spicy Bloody Mary Cocktail is the perfect cocktail for brunch or any time of day. This is a cocktail spicy food lovers will adore! When it comes to cocktails, I am much more in the savory cocktail group. I will bypass a lemon drop for savory and spicy bloody Mary any day of the week. Somewhere along the way, Bloody Mary’s got the designation as a “Brunch cocktail” along with mimosas. Now, I don’t know about you, but I could drink a Bloody Mary Cocktail, any time of day. What is in a Bloody Mary cocktail? 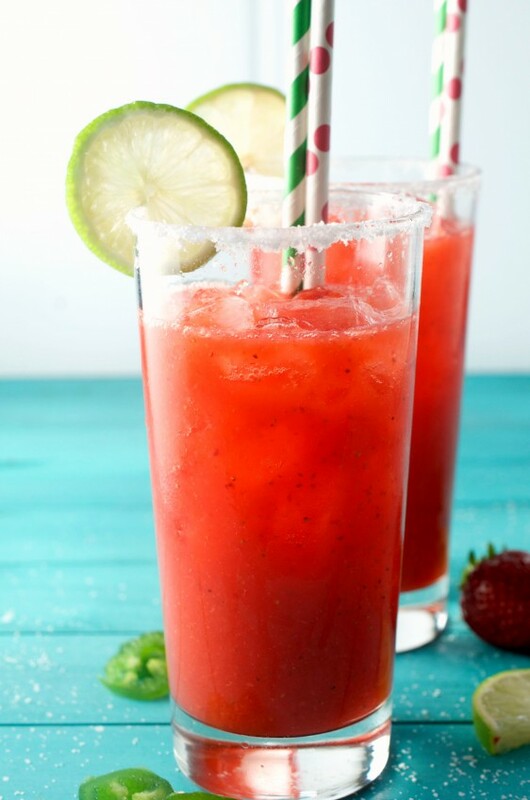 To make a traditional Bloody Mary Cocktails you use made with tomato juice, vodka, Worcestershire, hot sauce, lemon juice and celery salt. Like the classic version, this Spicy Bloody Mary is made with tomato juice, vodka and Worcestershire. It also gets a little kick from some cajun hot sauce and horseradish. 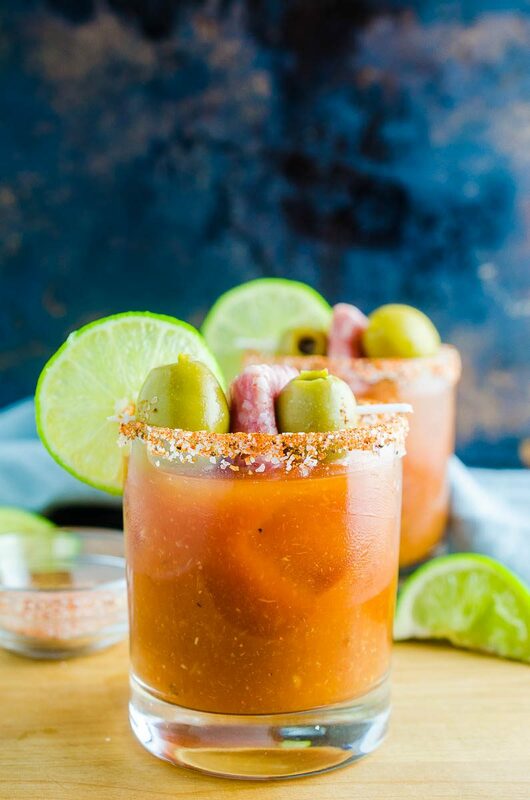 And instead of the celery salt, the glass of this Spicy Bloody Mary is coated with a cajun seasoning/kosher salt blend. And it is spicy, savory perfection. How do you make a Spicy Bloody Mary Cocktail? 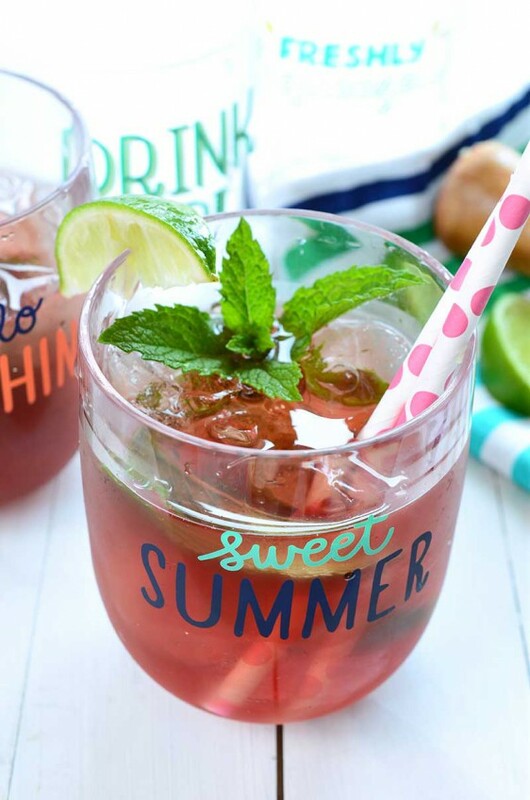 Step one: You’ll want to prepare the glass by running the juicy side of lime along the rim of the glass. This makes it possible to adhere the spicy cajun seasoning/salt mixture to the rim. Step two: In a small pitcher, whisk together tomato juice, vodka, horseradish, Worcestershire, hot sauce and lime juice. Step three: Add ice to the prepared glasses. 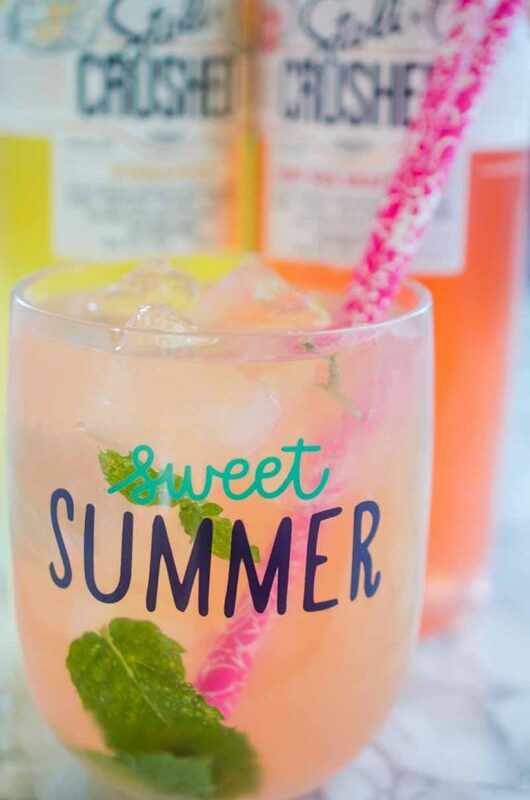 Pour the cocktail over the top. Step four: Garnish and serve. What do you garnish a spicy bloody mary with? This is where creativity really takes ahold. You can garnish a bloody mary with just about anything. Just look at how crazy some bars get with their garnishes. 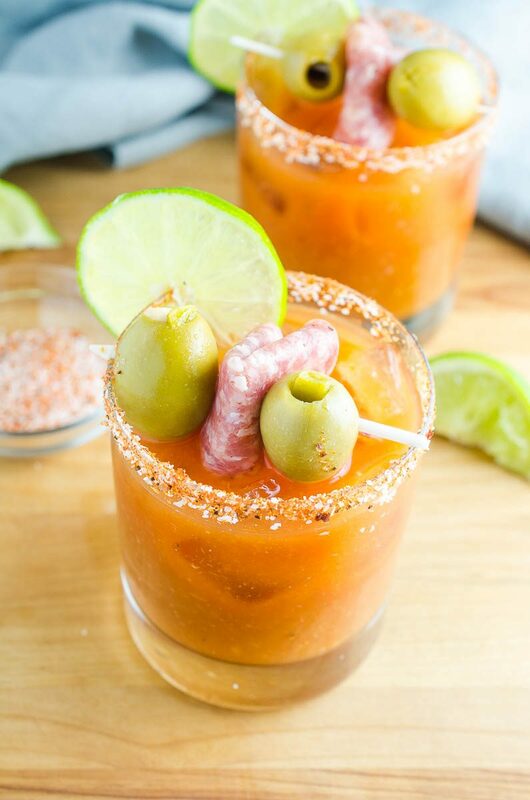 Traditionally, a bloody Mary will be garnished with a celery stalk and olives. That is just fine. However, for this spicy bloody Mary, I wanted to up the spice factor a bit. 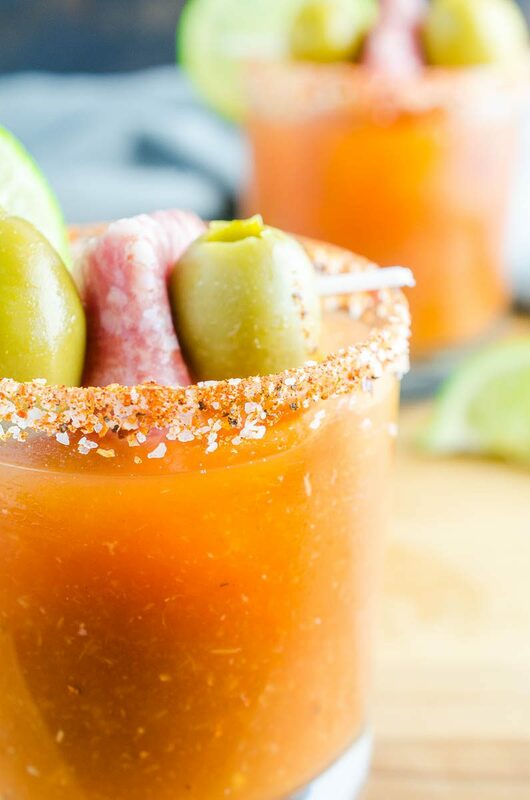 For this Bloody Mary, Jalapeno and Garlic Stuffed Olives and spicy salami make the perfect garnish. Pepperonicini would be great too! Now, if you’re like me, you like things really spicy. If you want to spicy up this cocktail even more, I recommend using Absolute Peppar Vodka instead of regular vodka. 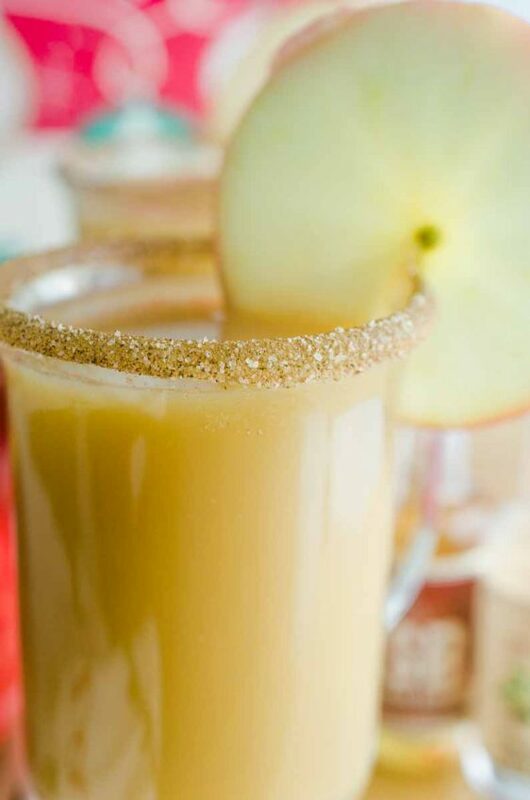 You could also substitute hot and spicy tomato juice for the regular tomato juice or add a touch more hot sauce. Maybe some Habanero Hot Sauce? Whatever you decide, I just know you’ll be moving Bloody Mary’s from your “Brunch Only” list to your regular old Happy Hour list. 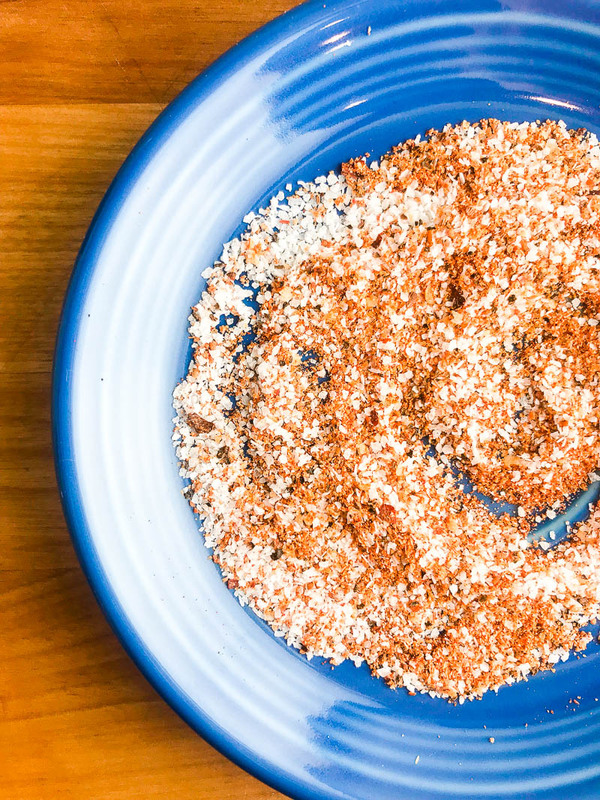 Combine salt and cajun seasoning together on a small plate. Run the juicy side of a lime along the rim of two cocktail glasses. Circle the glass in the mixture so the seasoning and salt coat the rim. Set aside. I seriously can’t wait to try this. My birthday is coming up this weekend and I will need one of these to help the next day! 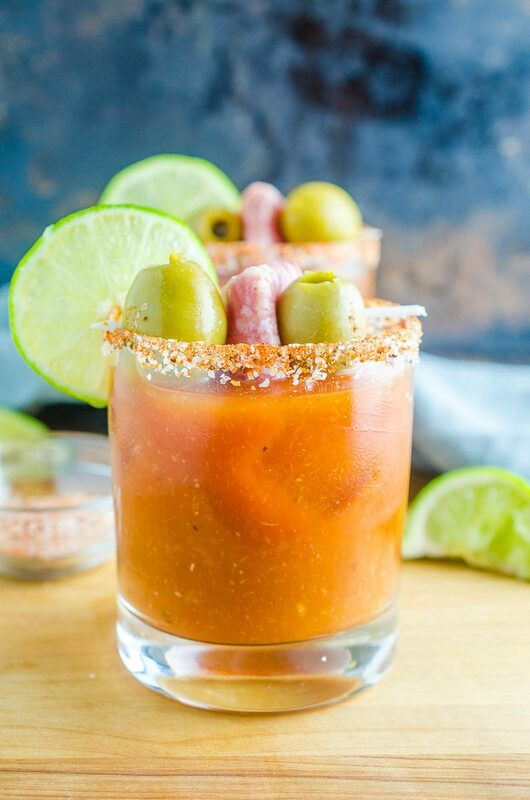 I’m not much of a bloody Mary fan, but I bet my husband would love it since it’s got a spicy, cajun kick to it! I feel like they call bloody marys Caesars in Canada? Or maybe they are different. I don’t know. 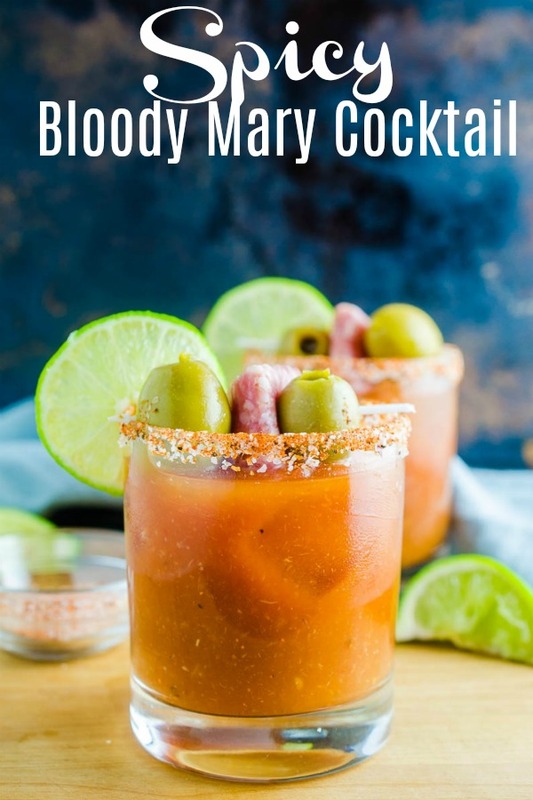 I have never liked bloody mary but yours is making it look really appetizing to me! Like I want to dip the garnish and sip! I love all those flecks of horseradish! I’m a huge believer that a proper bloody mary should have visible horseradish. What a great recipe! I have only recently become a fan of Bloody Mary’s. 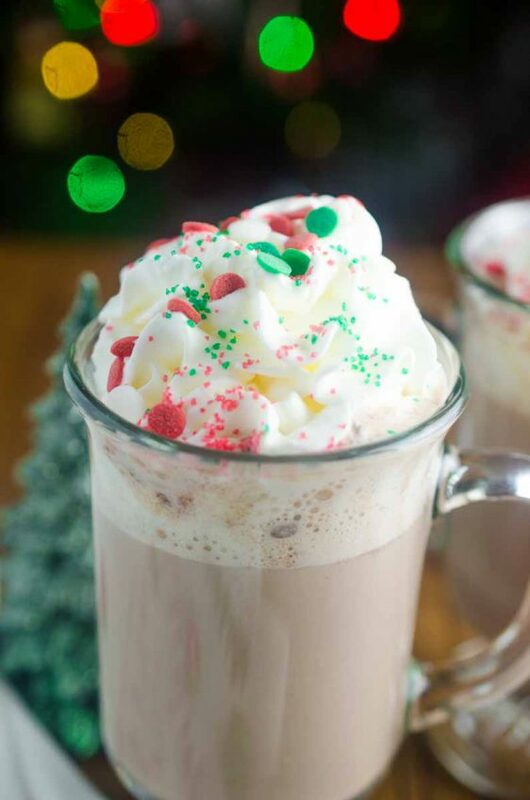 I’ve never attempted to make one of my own, but when I found your recipe I told myself THIS is the recipe to make! I can’t wait to try it! I found this at the right time! I plan on making this for Easter, a mix of this and regular! Thank you for sharing! One of the things I most love about brunch doesn’t have anything to do with the food, but the bloody Mary cocktails I can consume! :) Your recipe looks outstanding and delicious!! You can’t go wrong with a spicy bloody mary! 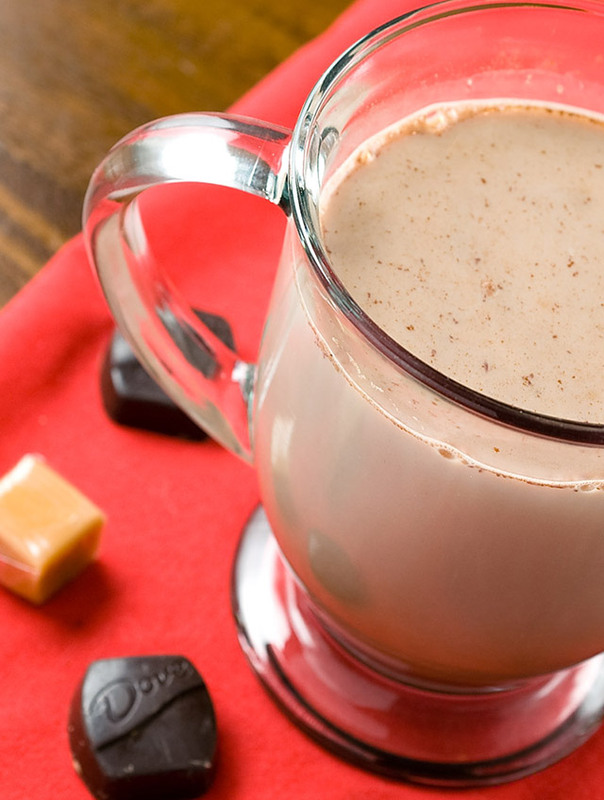 I wish it was the weekend so I could whip one of these up! Even though I’m not a spicy fan..for some reason that all changes when it comes to a bloody mary. So making this. Sometimes if I wonder if I order them for the garnish…love the twist with the salami. And the cajun salt on top. Next brunch this is on the menu.